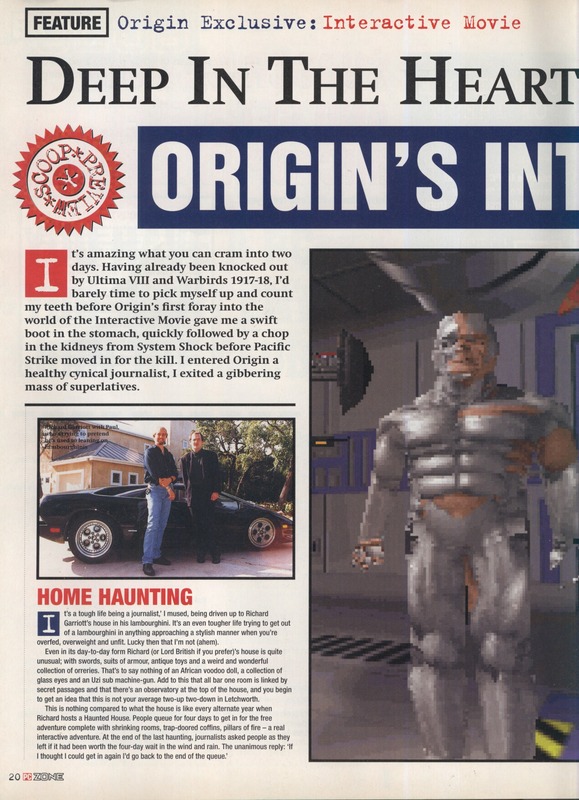 This is the second part of an article on Origin from the February 1994 PC Zone. If you are wondering where part one is, the short answer is that I don’t have the January issue. 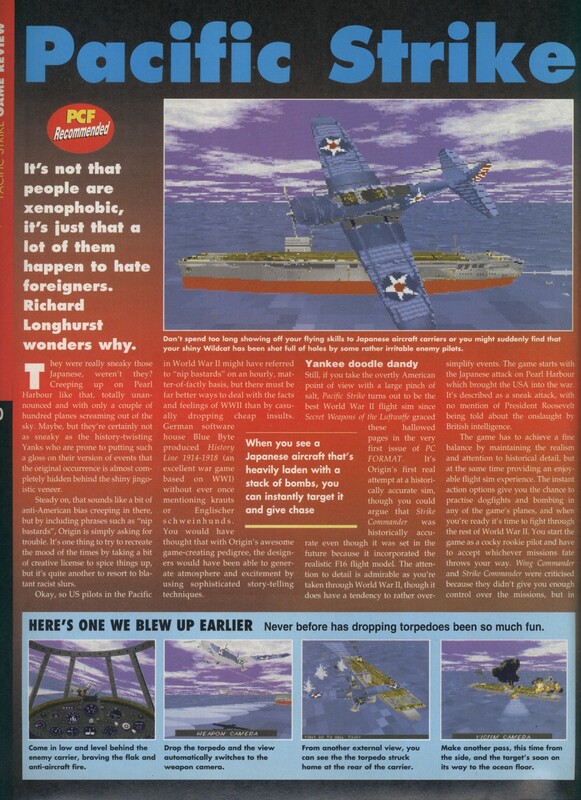 That apparently dealt with Ultima VIII and Warbirds 1917-1918 (Warbirds later become Wings Of Glory). It’s strange that the Strike branding wasn’t used for the title really although to me a game called French Strike conjours up images of a gallic airport worker simulator. 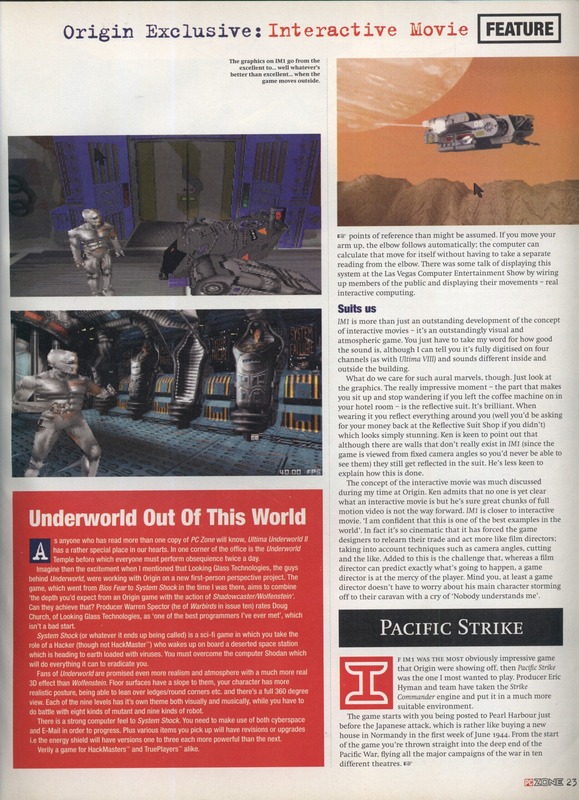 This article concentrates on previews of Bioforge and Pacific Strike with passing mentions to Wing Commander and System Shock. 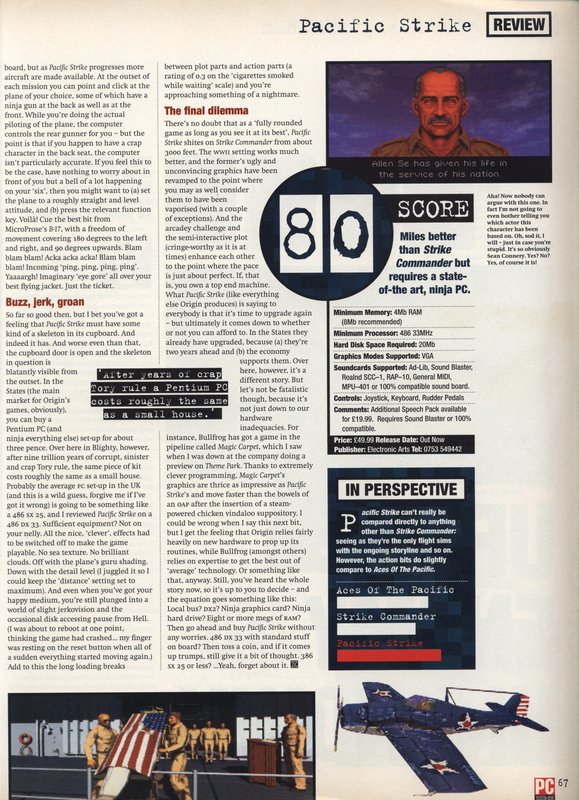 According to this System Shock was called Bios Fear for a time which I have to say would have been a great (if not all that commercial) title. 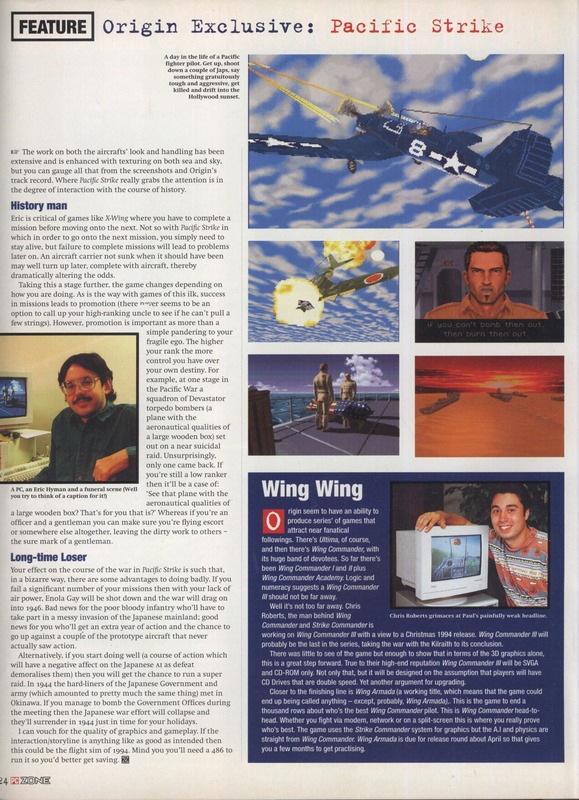 The reviewer starts off by stating how he hasn’t liked any of the Wing Commander games and finishes by blaming the speed of Origin’s games on bad programming. 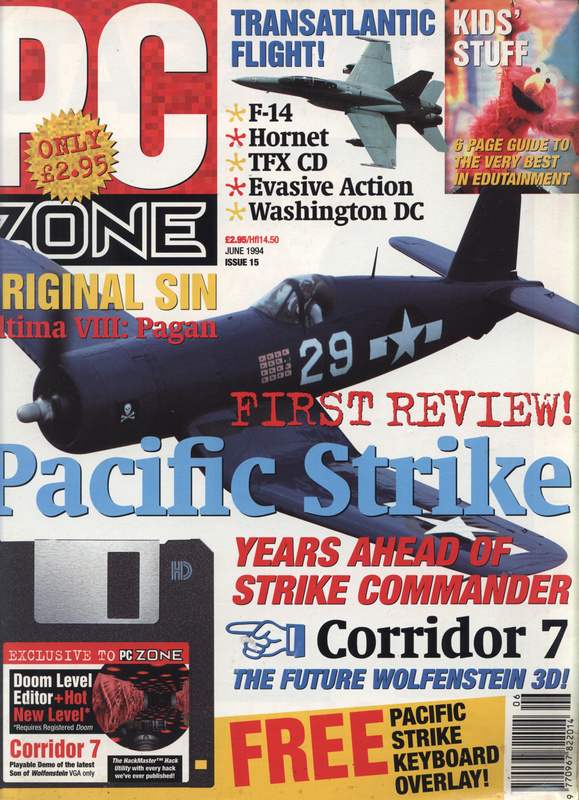 This doesn’t exactly ingratiate him to me but if you couldn’t cope with a bit of banter/abuse PC Zone wasn’t the magazine to read back in the 90’s. It is actually a fair review for the most part and I wouldn’t argue with the final score. I did some more work on the site last night. Even the less observant will have noticed the new logo at the top. This came out better than I expected but I may still tweak it. It’s based on the 1989 Origin product catalog cover, except this has a whole lot more balls. The more observant might have noticed that the images on this post actually use proper thumbnails instead of downloading the full size file and then scaling it down in your browser. This doesn’t sound like much but it’s a definite novelty for this site. Whether I can be bothered to go back through 600 posts and give them the same treatment is debatable but it wouldn’t be a bad idea. I’ll at least do the magazine scans. Before that, the next job is a new logo to replace the red dot that came with the theme. 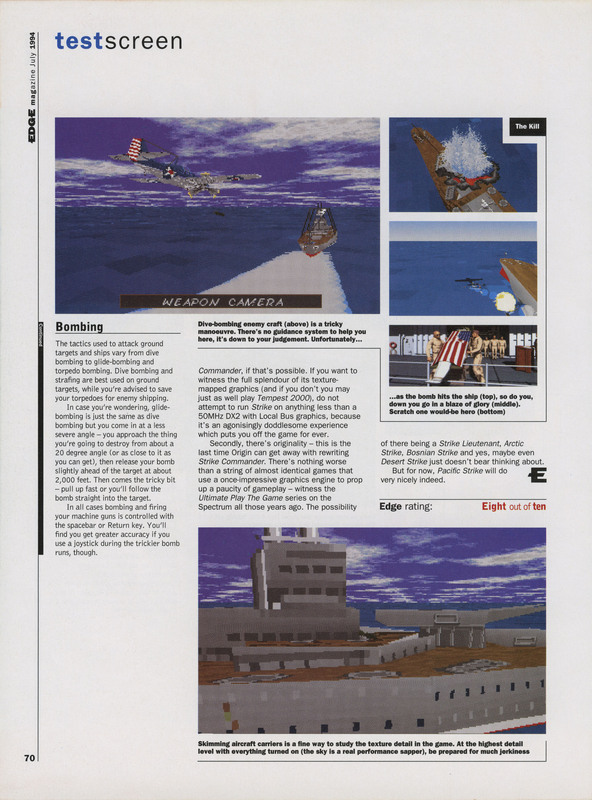 I notice I’ve been getting a load of hits from simhq in the last day or two so I thought I’d put up a review of Pacific Strike taken from the July 1994 Edge magazine. 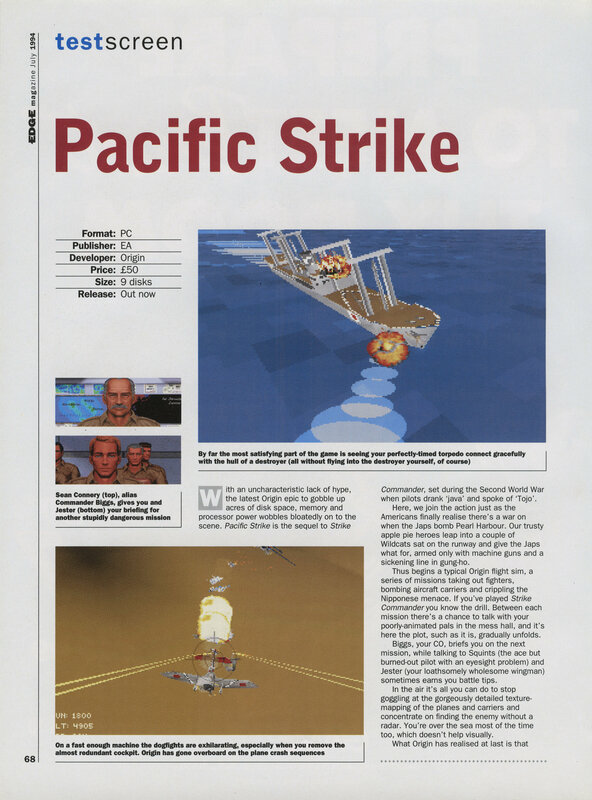 I’ve only really suffered my way through most of the sims on here, as they just aren’t my type of game but I did enjoy Pacific Strike. 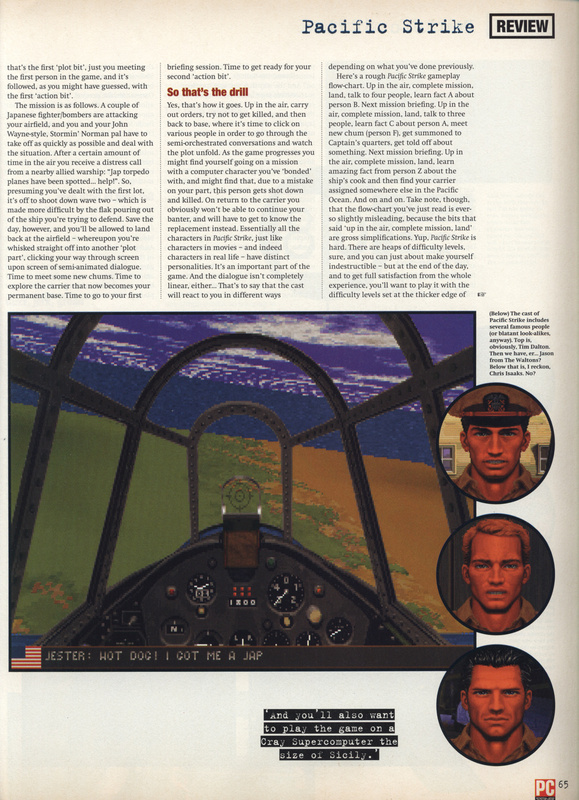 It appeared to concentrate on fun rather than realism but most of all the slower flight speed and lack of long range missiles made it far more of a dogfighting game than Strike Commander. The Edge reviewer more or less shares my views and liked it enough to give it a score of 8/10. 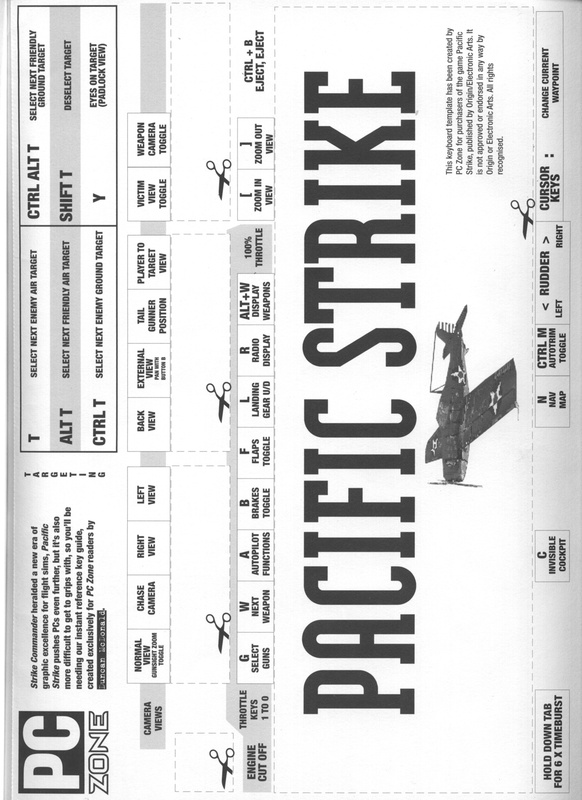 I started up again this afternoon on Pacific Strike expecting to just plough through a few missions and was a little surprised when I actually started to enjoy it. I’m not sure if I finally got the hang of it or if it was the better airplanes but I struggled a lot less to shoot things right from the start. That’s not to say I sailed through all the missions even on the rookie mode. I still resorted to bailing out on one mission – the objectives were completed so I didn’t fail it. I even got an award. The missions themselves carry on along much the same lines with the Japanese/Americans attempting to take islands and us trying to stop/help this. The missions start to take an effect and after flying defensive missions we finally get to go on the offensive. This starts out with a mission to destroy airfields. These missions are the sort of thing I’ve seen before in Strike Commander – the larger strike groups and soft targets make it slightly more entertaining. I finally read the manual and now know how to target ground objects which helps no end. Unlike Strike Commander, they can’t be targeted once blown up so I know where I stand all the time. Most of the missions in the second half of the game seem to involve ground targets. I find these easy to take out and usually concentrate on them, leaving the fighters to my wingmen until I’m done. The offensive missions continue with a strike against the Japanese fleet who are all located in a natural harbour. I get to use torpedos on this mission which are allegedly harder to hit with than bombs but within this game its impossible to miss as far as I can tell. The new armaments keep coming with air-to-ground rockets. These are the equivalent of the rocket pods in strike commander – one hit seems to kill pretty much anything. 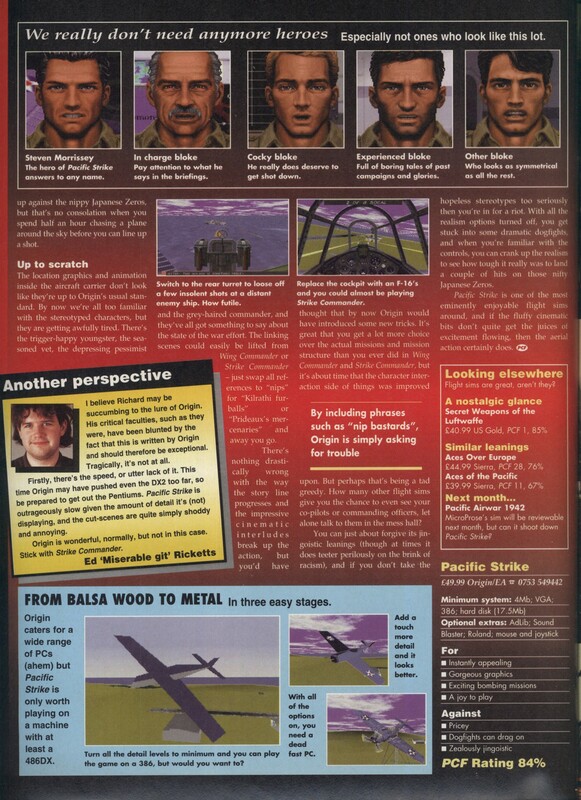 We also get napalm later on which I never used. There is the occasional bug still present in the game with a couple of crashes and the odd plane that flies impossibly high – I end up chasing this one above the cloud textures. I’m having severe trouble keeping wingmen alive – basically they all die except Jester who is presumably immune. 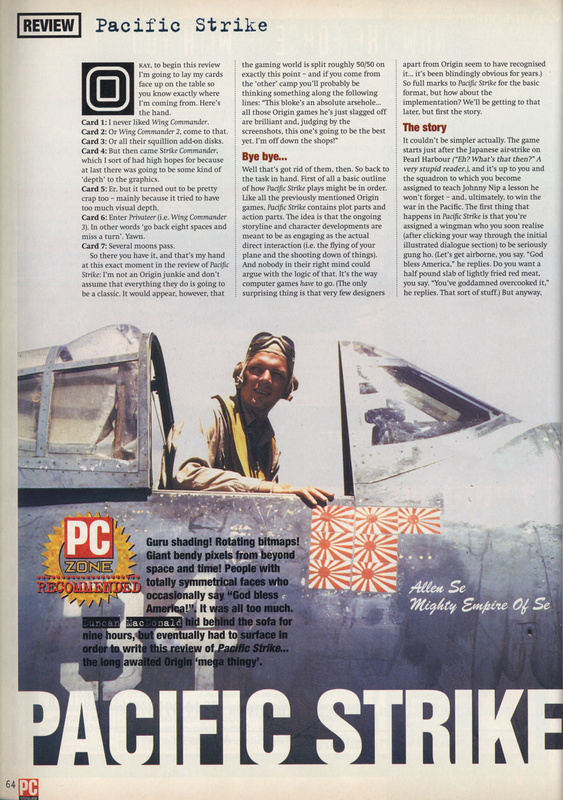 I no doubt missed out on loads of story between missions due to this but I really don’t want to have to fly the missions over and over just to keep them alive. They are replaced during flight anyway by non-story pilots who I never get to meet elsewhere. The offensive missions keep coming and we go up against 6 carriers. They all die with a single torpedo – although I don’t remember seeing more than a couple. I make it to the games final mission. We have established bases just outside of Japan. The emporer is prepared to surrender but the dictator is not and we must assassinate him. This final mission isn’t actually that hard – there are quite a few zeros to take on but nothing much more than I’ve seen previously. The dictators house blows up with a single rocket. 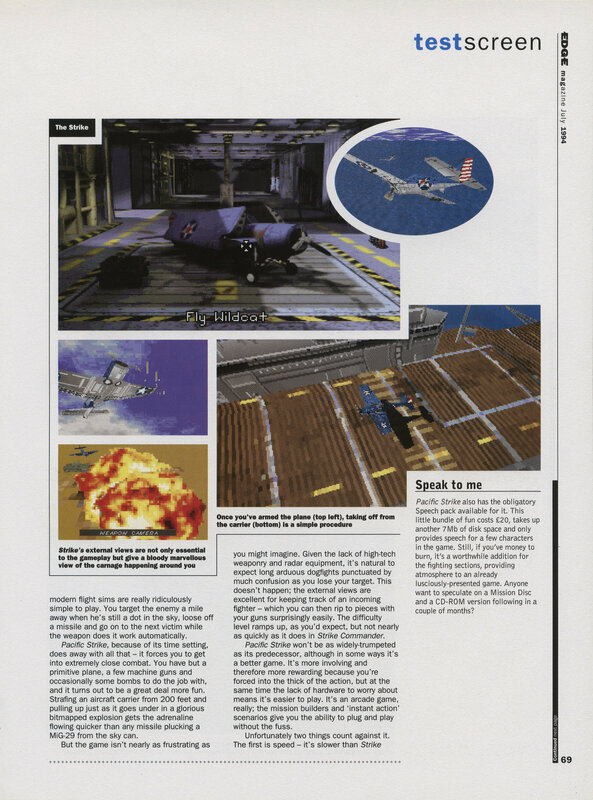 The final cutscene shows the surrender of Japan and the atomic bomb being boxed up unused due to our success. I was expecting to need most of the week to finish this game – I’m sure it got massively easier today. It definitely got a lot more entertaining. 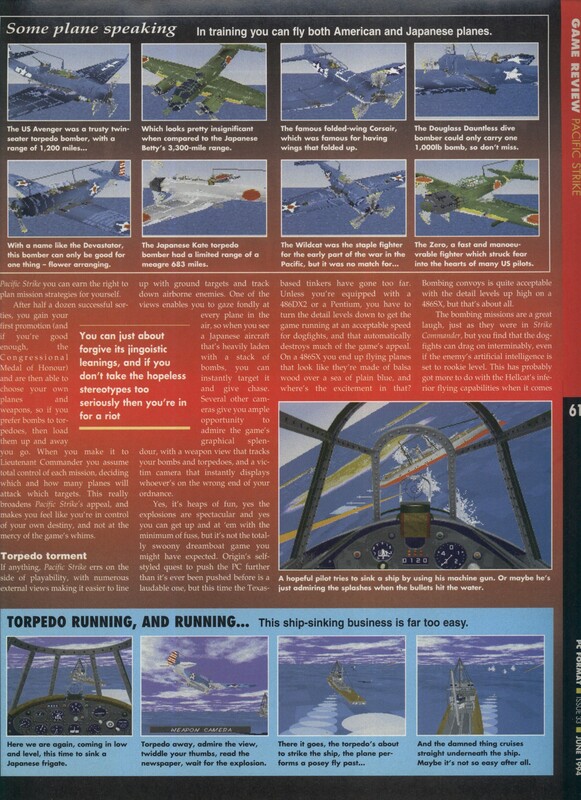 It may mirror real life but its strange for the game to start out with the hardest missions and then for them to get easier as the better planes come along. 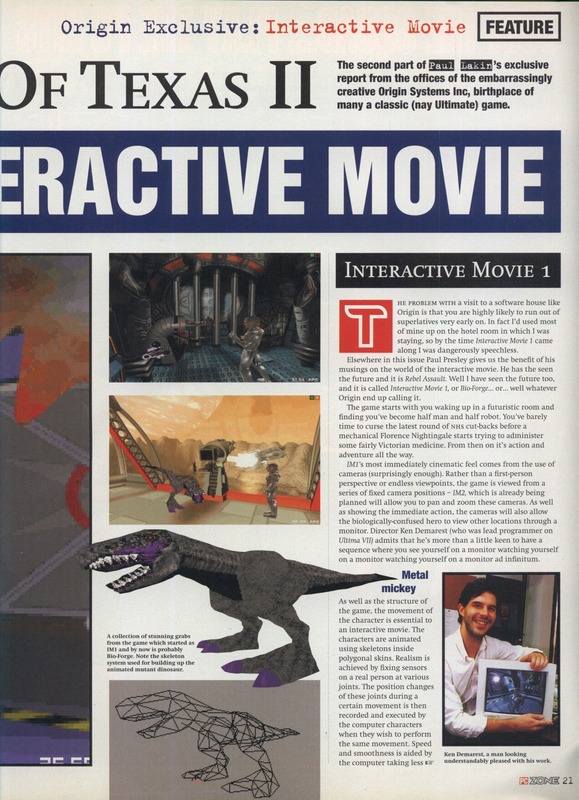 The rules of game design would always say you should do things the other way around. I would have given in on the game early on under normal circumstances. 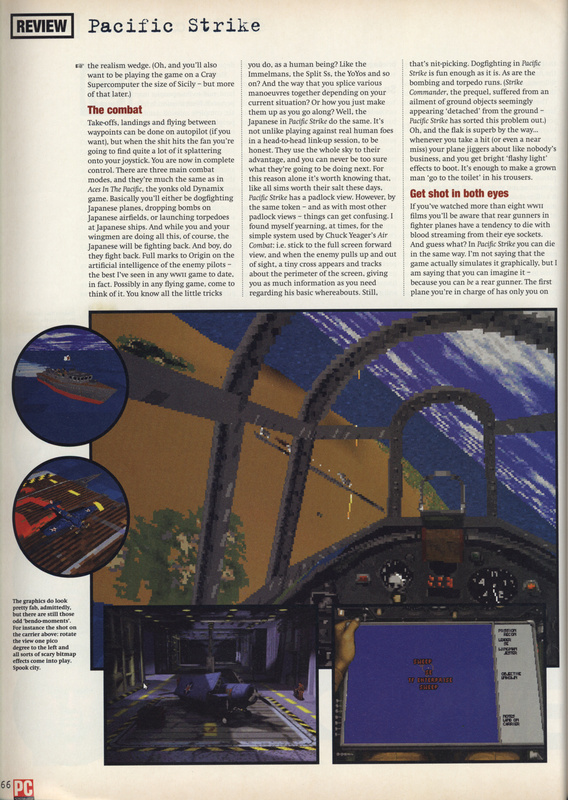 I would have been missing out though as in the end this was not that much less fun than Wing Commander and a lot better than Strike Commander. I may even go back to this some day and try to keep the pilots alive but I’d much rather press on to the next game right now. The storyline wasn’t all that interesting and I’ve skimmed over it as there just isn’t that much to say – constricting yourself to real life events doesn’t help here. As a Brit, I’ve more interest in the war in Europe but I’ll get my chance there with Wings Of Glory (admittedly in WW1). Despite that, I’m left feeling that this game deserves a better reputation and was hurt by a steep learning curve, bugs/performance problems before the patch and all the tedious/difficult missions being at the start of the game before you have the skills to play them.